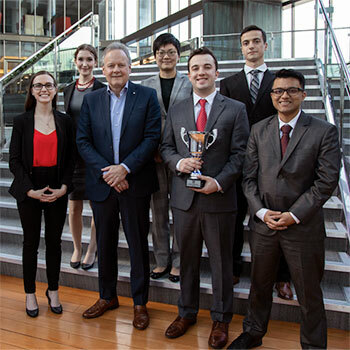 A team of students from Wilfrid Laurier University’s Lazaridis School of Business & Economics are champions of the Bank of Canada's fourth annual Governor’s Challenge. Fourth-year students Cindy McCormick, Michael Davenport, Colleen Spencer, Andrew Foran and Tanzin Kabir won the challenge during an event in Ottawa on Feb 16. This is the second consecutive year a team from Laurier has won the national competition, which sees students present an economic outlook and monetary policy advice to the Bank of Canada. The Laurier team won an initial round of the Governor’s Challenge in November to advance to the final round. To prepare for each round, the team assessed the current and prospective economic climate in Canada, made projections of macroeconomic variables and discussed possible foreign and domestic economic risks. Based on their analysis, the team delivered a 15-minute presentation to a panel of senior executives from the Bank of Canada and private sector. The presentation was followed by a 15-minute question-and-answer period. Students advised on whether the bank should raise its key interest rate, lower it or leave it unchanged. Faculty members Christos Shiamptanis and Ke Pang served as coaches for the Lazaridis School's 2018 Governor’s Challenge team. Eight months of hard work, preparation and some late nights led to the Laurier team’s win. The team first prepared recommendations for the initial Governor’s Challenge round in the fall. But economic conditions in Canada are continuously changing, with new data released regularly, so the team altered its model and recommendations for the final round. The two weeks leading up to the national challenge were demanding for the students and included daily three-hour gatherings with Pang and Shiamptanis to practice their presentation. So, what did the team recommend to the Bank of Canada? “Based on an analysis of the global economy and the Canadian economy, as well as a risk analysis, we recommended the Bank of Canada hold the interest rate at the current level of 1.75%,” says Davenport. The Bank of Canada’s Governor’s Challenge provides students a glimpse into what it’s actually like to make policy decisions at the Bank of Canada. “I’ve learned a lot of transferable skills, to communicate, think quickly and to be able to answer questions,” says Spencer. The excitement and celebration didn’t end in Ottawa for Spencer. She leveraged the hands-on experience gained from the Governor’s Challenge to secure a job after graduation. Spencer has been offered a full-time employment opportunity with the Bank of Canada. Read the Bank of Canada’s news release.